As we all know that the construction and house decoration industry, many people are using environmentally friendly materials instead of the original material, because the wood plastic material is a new environmentally friendly energy-saving materials, WPC Made of wood fiber and plant fibers produced by, so that the quality of wood-plastic material without any problems, light weight, easy delivery, very popular. 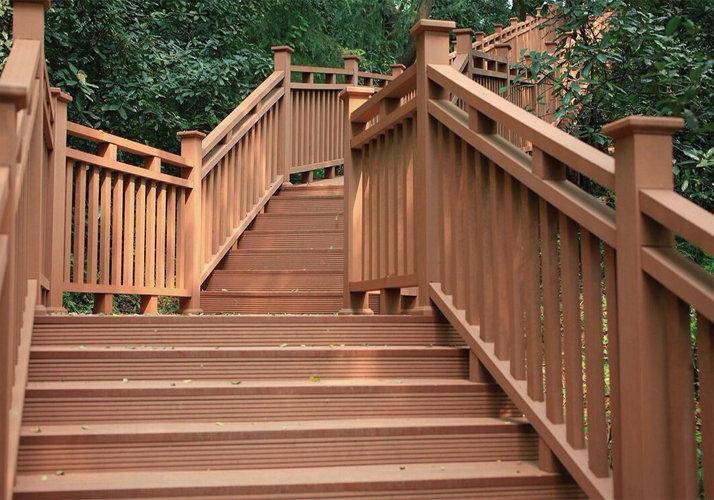 Environmental protection wood plastic handrail have lots of advantages, this wpc handrail waterproof, moistureproof, fire resistance ,will not be crack, etc.,when the wooden plastic handrail installed in the water environment, Is not deformed, is completely replace some of the wood products. WPC can be bent by heating. And wood-plastic is the amount of bending to a certain extent. Therefore, long-term storage, should pay attention to the flat ground, to prevent deformation. In view of the advantages of wood plastic, even in the outdoor , wood plastic will not rot, crack or wrap, in addition to the ability to have anti-ultraviolet, so wood does not require special maintenance. This is make wood plastic products in the future management becomes very easy. Environmental protection wood plastic handrail easy install , can save you lots of time and maintenance cost , our company free sample of product, we also look distributor in different country .